I finished knotting 528 knots to tie on the new warp - - only took a couple of hours - that wasn't too bad except for a bit of a sore back. I will need to figure out how to raise my legs up the next time. The worst part of the warp was rolling the yarn onto the back beater...what a twisted and messy journey. I had to roll on about six to eight inches at a time then take out the twists and knots. It seemed like a real long warp! Sometimes I wonder where I get all my patience. 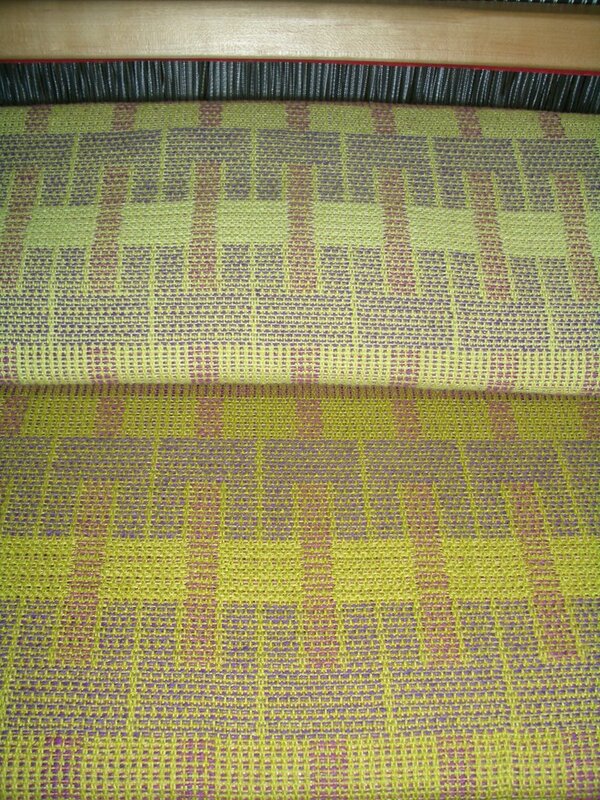 I have woven twice since I got the warp all on. The first towel is done so I took a picture of the new warp and put the towels from the first warp on the top for comparison. 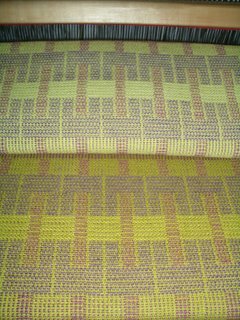 You can see how the second warp is definitely a more saturated green. It's an odd color combination but I do like it. I like the first warp too. It will be tough to send them away.